图2 木蚁 （Camponotus leonardi）生境的3-D 模型. Anderson SB, Gerritsma S, Yusah KM, Mayntz D, et al. "The Life of a Dead Ant: The Expression of an Adaptive Extended Phenotype." The American Naturalist 2009; 174 (3): DOI:10.1086/603640. Marcia Stone‌The Secret Lives of Thai Fungi Revealed. 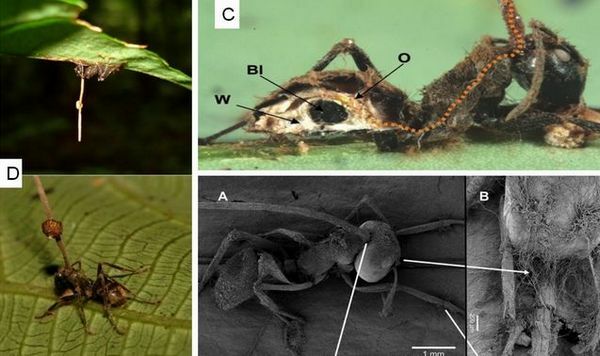 Hughes, D. P., Wappler, T. & Labandeira, C. C. Ancient death-grip leaf scars reveal ant–fungal parasitism. Biol. Lett. advance online publication doi:10.1098/rsbl.2010.0521 (2010). Pontoppidan M-B, Himaman W, Hywel-Jones NL, Boomsma JJ, Hughes DP. "Graveyards on the Move: The Spatio-Temporal Distribution of Dead Ophiocordyceps-Infected Ants." PLosS ONE 2009; 4 (3): doi:10:1371/journal.pone.0004835. Yanoviak, S.P., Dudley, R., and Kaspari, M.(2005). Directed aerial descent in canopy ants.Nature 433, 624–626.